Presently a shrinking labor force is a challenge for Canada. It is caused by an aging population and high rate of outward migration of qualified graduates. One way to plug this gap is by using the skilled worker Canada immigration. Today the Engineering Project Manager is the heavy in-demand occupation in the Express Entry system. The presence of an experienced Engineering Project Manager assures that construction project is running smoothly. Canada has a booming housing market and this serves as an important indicator in the high demand for this post. Additionally the federal government is also planning and implementing many major infrastructure projects. The tasks of an Engineering Project Manager are to look into the schedule, plan and forecast aspects and technicalities regarding a project. They must also ensure that team resources reach the right areas, by using their expertise in that matter. The Managers must solve the problem and ensure smooth functioning of a project. They must also be adept in communicating with clients, look into timescales and costs, have a detailed planning, and select a proper team. Furthermore they must deal with negotiation with contractors, time management and report about the progress of a project. The undergraduate and postgraduate degree holders in Engineering or Project Management qualify for the role in Engineering Project Management. A background in management, business, construction, science or technology is also helpful. Project managers graduate after working on a specific project and then qualify to take up management. They get a dual experience. Today there are many computer programs aimed specifically to help in project management, and their knowledge is also very important. 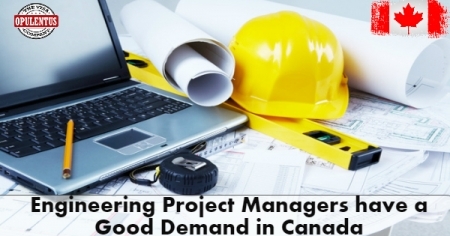 Accreditation by a Canadian project management institute is helpful. This will assure that the qualifications assessment meets the Canadian equivalency standards. Thus the international talent will meet the demands of the current dynamic labor market in Canada.